A wave of new and innovative research vessels are set to help scientists enhance their understanding of the oceans. MTR profiles several of these ships currently in designe and construction across the globe. The U.K.’s new polar research ship rose to fame when Boaty McBoatface took the internet by storm as the leading vote getter in an online naming contest. The U.K.’s Natural Environment Research Council (NERC) eventually chose to call the ship RRS Sir David Attenborough, a name better fit for a $256 million high-tech research ship (though the Boaty McBoatface name will live on via an AUV onboard). 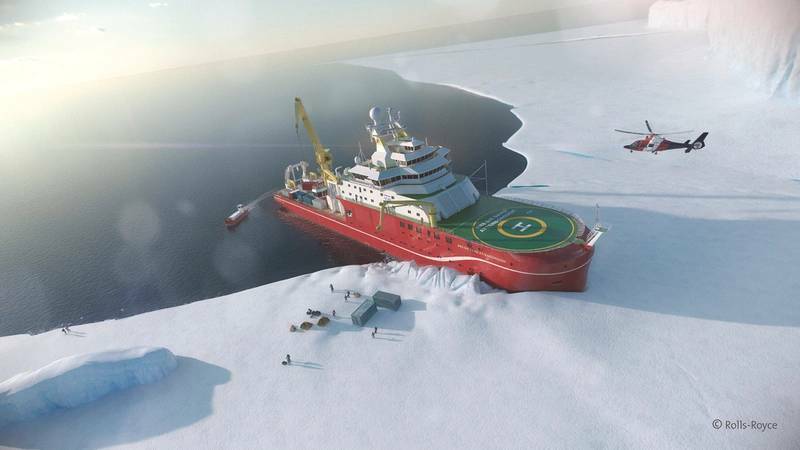 RRS Sir David Attenborough will be one of the world’s most technologically advanced research vessels when it sets sail in 2019, operated by British Antarctic Survey. Currently under construction at England’s Cammell Laird shipyard, the Rolls-Royce designed vessel will replace RRS Ernest Shackleton and RRS James Clark Ross to aid extended scientific research missions in both Antarctica and the Arctic. The Polar Code 4 ice class vessel will be equipped with wide range of specialist scientific facilities, instruments and laboratories enabling scientists to study the ocean, seafloor and atmosphere. Robotic submarines and marine gliders will collect data on ocean conditions and marine biology and deliver it to scientists working in the ship’s on-board laboratories, while airborne robots and onboard environmental monitoring systems will provide detailed information on the surrounding polar environment. Scientific cargo: Approx. 900 cu. m.
A new oceanographic icebreaker being built for the Norwegian Polar Institute (NPI) was launched by shipbuilder Fincantieri in Italy earlier this year. The $177 million vessel, RV Kronprins Haakon, due for delivery by the end of 2017, will be owned by the NPI, while the Institute of Marine Research (IMR) will have operational responsibility and the University of Tromsø will be her main user. The high-tech PC 3 class icebreaker vessel was designed by Rolls-Royce Marine to operate year round in polar waters, providing a high-tech facility for the study of the marine environment. At 100 meters long and 21 meters wide, with a gross tonnage of about 9,000 tons, Kronprins Haakon will be able to accommodate 55 people (including research personnel, students and crew) in 38 cabins. Its hangar at the bow will have two helicopters and the unit will be equipped with a ROV, AUV and moon pool, among other high-tech equipment. Kronprins Haakon will have a cruise speed of 15 knots and will be able to move on independently through ice thick up to one meter and with particular silence requirements to avoid disturbing the sea environment. The ship was built according to criteria ensuring minimum environmental impact and reduced radiation of noise underwater, so as to allow studies on fish and marine mammals. She will be able to carry out its oceanographic and hydrographic research activities in any area of operation. Kronprins Haakon will set sail for scientific expeditions starting in 2018. 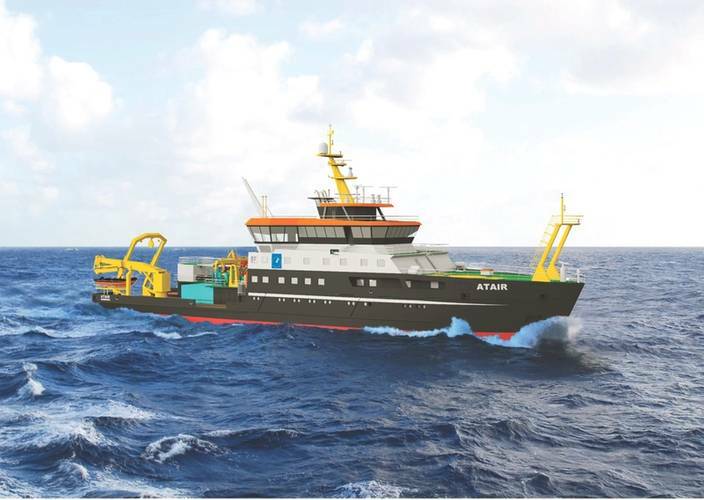 The Fassmer shipyard in Germany is currently constructing a new research vessel to be owned by Bundesamt für Seeschifffahrt und Hydrographie (BSH), the Federal Maritime and Hydrographic Agency. The new 75-meter-long ship will replace her 30 year old namesake, the Atair, and will be the first German research vessel operating on liquefied natural gas (LNG) fuel. Wärtsilä will supply two six-cylinder Wärtsilä 20DF dual-fuel engines capable of running on either LNG or conventional liquid fuels, one six-cylinder Wärtsilä 20 engine, two exhaust cleaning systems and a Wärtsilä LNGPac fuel storage, supply and control system. The ship fulfills the DNVGL classification society’s ‘Silent R’ rating, thus allowing the sonar equipment to be used without disturbance from underwater radiated engine noise. Kongsberg’s Integrated Vessel Concept for research vessels delivers a fully integrated operator environment, equipped with high level acoustic data acquisition, dynamic positioning, propulsion control, navigation and vessel automation. Atair II will operate in the North Sea and the Baltic Sea, conducting hydrographic surveys and wreck search operations in addition to marine environmental monitoring, as well as the technical testing of navigation and radar equipment. The vessel is scheduled to enter service in early 2020. Gulf Island Fabrication, Inc. subsidiary Gulf Island Shipyards, LLC, received a contract from Oregon State University (OSU) for the construction of a Regional Class Research Vessel (RCRV) with an option for two additional vessels. OSU has engaged with naval architecture and engineering firm Glosten to lead the design and construction of the next class of ocean-going research vessels for the National Science Foundation (NSF). These state-of-the-art 193-foot ships will be highly flexible, multi-mission platforms that maximize energy efficient design concepts. 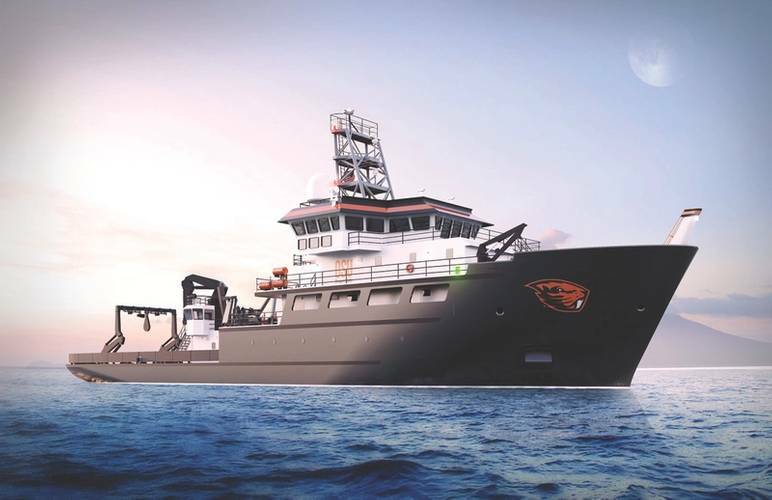 The first vessel will be built in Houma, La, and will be delivered to OSU in the fourth quarter of 2020. This vessel will be ABS Ice-Class C0 and DPS-1, Green-Marine Certified, acoustically quiet, and carry up to 29 crew and embarked scientists. RCRV will have the ability to collect high quality and high resolution ocean floor and subfloor acoustic data (multibeam) from near shore to midwater depths. RCRV will also introduce a deployable centerboard that will, with high positional precision, provide at versatile platform on to which a wide variety of acoustical sensors can be easily installed based on specific mission requirements. The first RCRV will be operated by OSU on the West Coast as part of the University-Oceanographic Laboratory System (UNOLS). Construction on China’s new state-of-the-art polar research ship is underway at Jiangnan Shipyard in Shanghai, China, with delivery scheduled for 2019. In 2012, the Polar Research Institute of China (PRIC) awarded a contract for the concept and basic design of the research icebreaker to Aker Arctic, who tailored the design for specific scientific missions in the Arctic and Antarctic. After the concept had been developed, Aker Arctic performed model tests in open water and ice at its Helsinki laboratory in order to verify the vessel’s performance. The new vessel will be about 122 m long and 22 m wide, and includes extensive scientific outfit including both wet and dry laboratories, a large aft working deck served by several cranes and winches, and a moon pool with scientific hangar that allows deploying CTD Rossette and other scientific instruments in ice-covered seas. Comfortable accommodation is provided for up to 90 scientists and crew. Large forward cargo hold, heavy crane and cargo fuel tanks allow the vessel to carry out resupply missions to scientific research stations. The aviation facilities include a landing platform and a hangar for two helicopters. The Polar Class 3 icebreaker will be capable of continuously breaking up to 1.5 m thick level ice with a 20 cm snow cover in both ahead and astern directions. 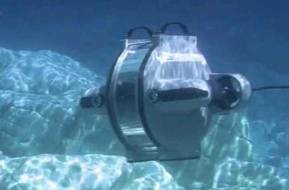 A special box keel will provide a disturbance-free flow environment for bottom-mounted scientific instruments in both open water and ice. The diesel-electric power plant and propulsion system, which consists of four main generating sets, two 7.5 MW azimuth propulsion units and two transverse bow thrusters, will provide the vessel with redundant DP2 class station keeping capability. Duke University said it has received $11 million for the construction and operation of a new state-of-the-art vessel that will expand teaching and research capabilities at its marine lab. The gift to the Nicholas School of the Environment from the Grainger Family Descendants Fund, a donor-advised fund at The Chicago Community Trust, provides $5 million to build the new 68-foot oceangoing research vessel and an additional $6 million to support operating costs. The ship will have wet labs and dry labs, oceanographic equipment, a galley and sleeping quarters. It will be an oceangoing classroom to train undergraduate and graduate students in oceanography and marine biology at the Duke Marine Lab at Beaufort, N.C. It will also be used to support science outreach programs for local K-12 teachers, students and community members. Researchers and instructors from other institutions will also be able to charter the vessel for scientific or educational purposes. Duke said its marine lab has been without a large research vessel since two of its boats were retired—the 135-foot Cape Hatteras in 2013 and the 50-foot Susan Hudson in 2014. Faculty members have since been unable to regularly take students offshore or participate in oceanographic work. The new vessel will allow researchers and other institutions to conduct research along the Atlantic seaboard in a wide range of vital fields, including marine ecology and conservation, biological oceanography and renewable ocean energy development. Design and construction is expected to take about two years. A shipyard has yet to chosen.